Thesis 1: There will be no pedagogical differences between learning in person and learning online. Thesis 2: There will be no distinction between instruction and assessment. Thesis 3: Adaptive and personalized learning will not be at the expense of learning community. Thesis 4: There will be no class scale. Thesis 5: Educators will stop insisting on inequality of outcomes. One of its main concerns [of Genre theory] is to discover and describe the major characteristics of kinds of writing (or speaking), important for participation in both formal schooling and the wider society. The label ‘genre’ is, in itself, not all that important, although it does establish the links of this approach with a tradition reaching back to Aristotle in ‘Rhetoric’. What is important is the broad range of ideas about writing, speaking and language, which underlie genre-theory, and their relation to literacy and education generally. Here then is a broad sketch of these ideas. The single most important idea is that language is a social phenomenon, and that to use language – to speak or write – is to be engaged in an entirely social activity. This allows us to make an equally important assumption, namely that everything about language – the kinds of words we use, sentences we construct, ways in which we interact with language – has a social reason and a social effect. In relation to writing this means, among other things, that the characteristic forms of writing – from choice of words and phrases, the kinds of sentences we use, to the kinds of texts which we write – can be explained by reference to the social contexts in which particular kinds of writing characteristically occur. So for example, the very ‘heavy’ style of legal documents relates to the practices of the legal profession. Or, to use another example, the style, the form, even the placement of newspaper editorials relate to the conception which editors have of their role vis-a-vis their readers and society itself. Speaking and writing are social practices; like other social practices, speaking and writing always have to be seen in relation to all the other social practices with which they interact. In particular, speaking and writing relate closely to social factors such as class, gender, age, ethnicity, geographic location. They are therefore always involved with issues of power and power-difference between individuals and groups. When we speak or write we always do so in particular social situations. This means that the language we use is fashioned by those situations, not only in what we say, but also in how we say things. For instance, in a job interview neither interviewees nor interviewers simply say what comes into their heads. Rather, the routine of the interview governs what each says and when. This routine itself is an expression of one aspect of what interviews are about: the introduction by the chairperson (“putting the interviewee at ease”); the opening question and response; the subsequent more detailed questions and responses; an invitation to the interviewee to ask questions in her or his turn; and the conclusion of the interview. There are other conventions governing how the interview is conducted: for instance, there are routines of etiquette which delimit just how probing or aggressive an interviewer may be; or how brief or how long responses should be. The point is that speaking in this context or in any other is not at all simply a matter of using words and sentences, but of understanding the rules which govern the whole interaction as a totality. Good interviewers and interviewees both understand mat there is a “script” to be known and to be followed (or to be changed subtly according to the particular circumstances). In other words, language here as elsewhere, occurs in the form of a whole text, as a meaningful event which is made coherent by its inter-meshing with all aspects of the social context in which it is produced. All language use is context-bound; hence language always occurs as socially meaningful, coherent text, that is, as a particular genre. Given the relative stability of social structures, social situations recur, and the purposes and goals of participants in these situations have a certain regularity, even predictability (for instance, having been to four job-interviews, the fifth one is likely to offer fewer surprises than the first one did). Consequently the texts which “grow out of” these situations have a certain stability and predictability. To be judged as a competent social being depends among other things, on the ability to use the genres which are appropriate to particular situations. Such competences confer a certain degree of social power. Even greater power accrues to the individual who, on the basis of familiarity with genres, can adapt them to her or his particular purposes. Not all members of society hold equal power. One means towards attaining greater power – greater degrees of freedom in action – is to have competence in the use of powerful kinds of texts in a society. Genre-theory holds out the promise of enabling teachers to understand forms of writing, and of their power, and to describe genres with sufficient detail and clarity for teachers to use as the basis for a teachable writing curriculum. Given that texts are entirely intermeshed with the social context in which they are produced, all aspects of that total context have their effect on the language of a text. As significant shifts occur in the context, so forms of language will change, subtly or markedly. For instance, in a job-interview the transition from the introduction to the next section is likely to be marked by a shift from statement to question. At the very least, students would need to recognise the various grammatical means by which statements and questions are formed in English. In other instances the shift may involve quite other areas of grammar: kinds of words used (complex nouns or simple nouns); various types of clauses (encoding different relations of nouns and verbs); various levels of syntactic complexity, and so on. These variations in language use are dealt with by the notion of register, that is, the contextually variable use of language. Register deals with the three variables of field (what is going on in the text), tenor (who are the social participants in the making and reading of the text), and mode (what is the role of language in a particular situation). Without a basic understanding of English grammar, and command of a minimal set of technical terms, neither teachers nor students can get beyond the level of intuition and of commonsense when it comes to writing. It is essential therefore that a literacy curriculum includes basic aspects of functional grammar, that is, a grammar which is oriented towards explaining what language does, and whose categories describe the uses rather than the formal aspects of language. 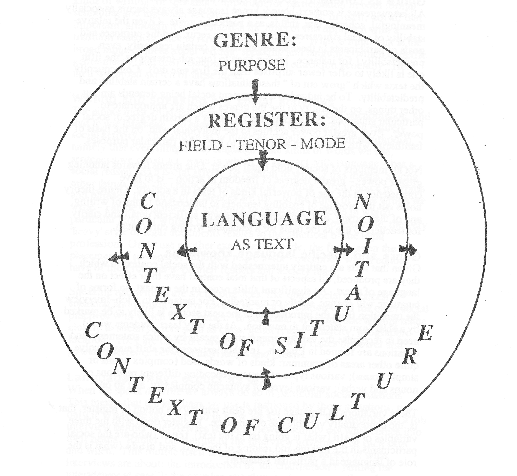 Texts are determined by genre (and other semiotic systems which are part of the context of culture) and register (the meanings associated with the context of situation – field, tenor and mode). Furthermore, the oral and written texts which people create also act upon and influence the contexts (genres and registers) which are part of the environment of all speakers and writers. Macken, Mary, Mary Kalantzis, Gunther Kress, Jim Martin, and Bill Cope. 1989. A Genre-Based Approach to Teaching Writing, Years 3-6, Book 1: Introduction. Sydney: Directorate of Studies, N.S.W. Department of Education, pp.6-8.